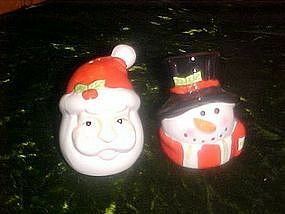 Cute pair of shakers for your Christmas decor. Frosty the Snowman and Santa Claus heads, measure almost 3 1/2" tall. Made of hand painted glazed ceramic, and have plastic stoppers. Excellent condition.